Larvae of the genus Arachnocampa, known as glowworms, are bioluminescent predatory insects that use light to attract prey. One species, Arachnocampa flava, is known to possess true circadian regulation of bioluminescence: light:dark cycles entrain the rhythm of nocturnal glowing. 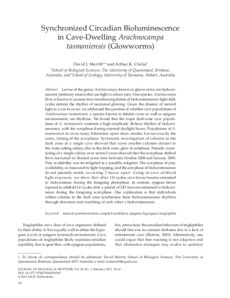 Given the absence of natural light as a cue in caves, we addressed the question of whether cave populations of Arachnocampa tasmaniensis, a species known to inhabit caves as well as epigean environments, are rhythmic. We found that the major dark-zone cave populations of A. tasmaniensis maintain a high-amplitude 24-hour rhythm of bioluminescence, with the acrophase during external daylight hours. Populations of A. tasmaniensis in caves many kilometers apart show similar, but not exactly the same, timing of the acrophase. Systematic investigation of colonies in the dark zone of a single cave showed that some smaller colonies distant to the main ceiling colony, also in the dark zone, glow in antiphase. Periodic monitoring of a single colony over several years showed that the acrophase shifted from nocturnal to diurnal some time between October 2008 and January 2009. Prey availability was investigated as a possible zeitgeber. The acrophase of prey availability, as measured by light trapping, and the acrophase of bioluminescence do not precisely match, occurring 3 hours apart. Using in-cave artificial light exposure, we show that after LD cycles, cave larvae become entrained to bioluminesce during the foregoing photophase. In contrast, epigean larvae exposed to artificial LD cycles after a period of DD become entrained to bioluminesce during the foregoing scotophase. One explanation is that individuals within colonies in the dark zone synchronize their bioluminescence rhythms through detection and matching of each other’s bioluminescence.